Since fish fillets don't always come in perfectly pre-measured packages, this is a great recipe to use up your leftover cooked salmon. Using almond flour helps keep these salmon cakes low-carb, and the grilled asparagus and avocado lime puree add light, fresh flavors to round out this quick and satisfying meal. Prepare the asparagus by snapping off the woody base of the stalks. Toss the asparagus spears with olive oil, and a little salt. Roast asparagus for 8-10 minutes depending on size and desired doneness. Skin the avocado and remove the seed. Mash the flesh with lime juice and a little salt, mix in mayonnaise, and set aside. Combine the salmon with the egg white, almond flour, spices, and lemon zest. Season to taste with salt and form into a cake. Cook in a hot skillet with a little oil. 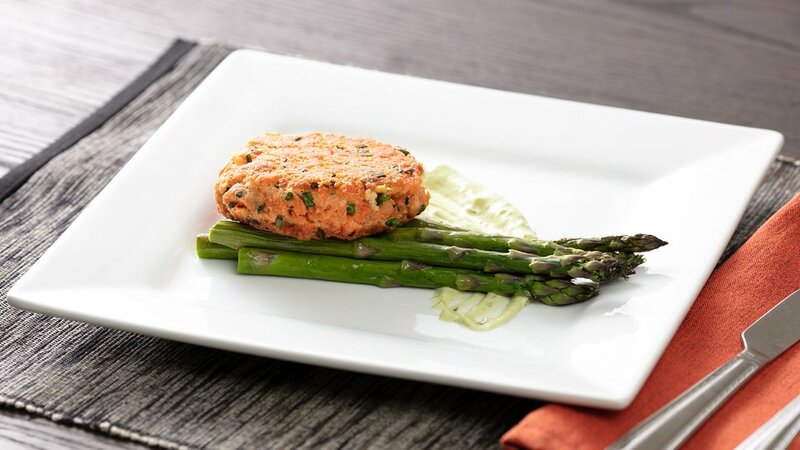 Cook salmon cakes for 3-4 minutes per side, serve with roasted asparagus and the avocado lime puree.